Your crisp looks mighty good-and the strawberry/cranberry combo sounds heavenly! Cranberries were a good sub! I loved the strawberry/rhubarb combo but the rhubarb was a pain to find. Your crisp looks wonderful in the mini pie plate, I’d never have thought to use that! 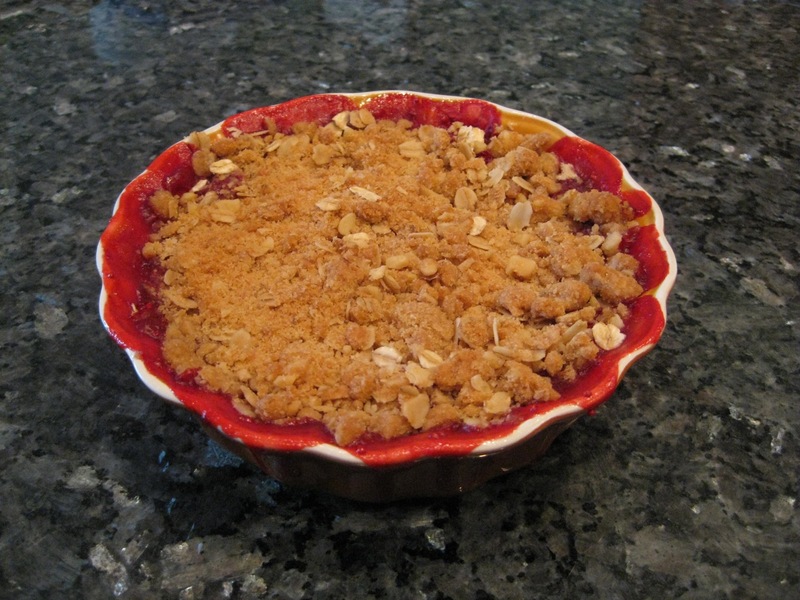 I love the idea of using cranberries! Looks delicious!! I do love cranberries! I think we should eat them year round. I bet the cranberries added a nice tart edge to this. The colour is stunning, and I’d be picking at the edges of this till you slapped my hands. I want to try this with cranberries, we are huge cranberry fans here and I think I should try that just to see, don’t you? Like maybe today for instance! Yours looks wonderful…all that crispy goodness! I think this would be good with cranberries. I’m with you, the best part of a crisp is the topping and the topping on this was excellent. I loved the ginger. Love your baking dish. Cranberries would be good! It looks great! I thought this was an exceptionally good crisp. I love the idea of cranberries with it. I love fruit desserts, and this looks just amazing. The idea of crisp on the top and bottom makes me swoon! Cranberries – perfect! I love the red seeping out on the edges of your baking dish. Yum yum. Your crisp looks delightful with all of that luscious red sauce oozing out the sides. I covet a piece of this right now – perfect for my brekky.